Many people know Rolex’s Day-Date line of watches simply as the Rolex President. While the “President” name actually only applies to the semi-circular, three-piece link bracelet designed specifically for Rolex’s Day-Date line of watches, the “Rolex President” moniker has become possibly the most commonly used nickname in the world of Rolex ownership. The President bracelet is the defining characteristic of the Rolex Day-Date collection. For a history of the Rolex President (the watch itself, not the bracelet) check out this one that we wrote way back in 2011, or watch our recent video on the watch, which can be found on YouTube. In the same way that the Jubilee bracelet was specifically designed for the Datejust collection, the President bracelet was created specifically for the launch of the Rolex Oyster Perpetual Day-Date in 1956. Since its introduction, the President bracelet has only been fitted to the Day-Date and certain precious metal versions of the Lady Datejust, and it has exclusively been craft from either 18k gold or platinum. Additionally, with the exception of the very first iteration, the President bracelet has always been fitted with Rolex’s Crownclasp – a concealed clasp design that creates a seamless effect throughout the entire band. Visually speaking, the President bracelet is a mix between the Oyster bracelet and the Jubilee. Rather than using flat-surfaced links like the Oyster bracelet, the President (which also employs a three-piece link design), uses semi-circular links that echo the profile of the Jubilee bracelet. 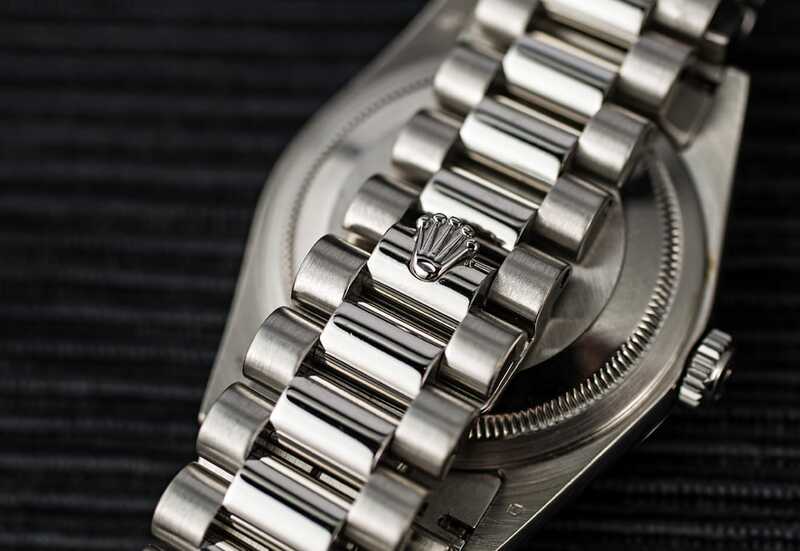 Although similar in appearance to Rolex’s other two iconic bracelet styles, the President bracelet has an instantly-recognizable design all its own, and is frequently imitated by other brands throughout the industry. President bracelets are only ever craft from precious metals, so if you see a silver-colored one, it is either made from 18k white gold or platinum. In 1965, almost a full decade after its introduction, Rolex’s President bracelet officially received its now legendary name. At the time, United States President, Lyndon Johnson wore a yellow gold Rolex Day-Date, and as a tribute to his choice in timepiece – and the watch’s exclusive use of precious metals – it was dubbed “the presidents’ watch” in a U.S. magazine advertisement. 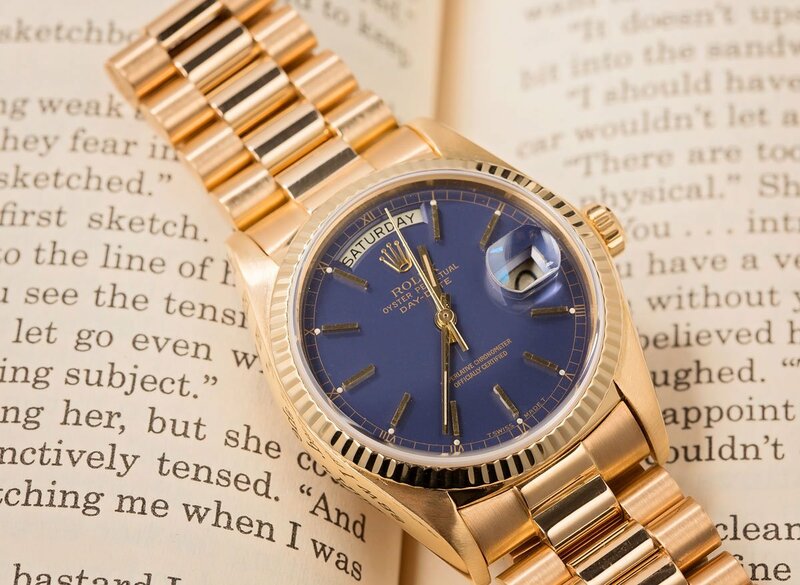 Originally, the “President” name only referred to the Day-Date’s bracelet; however due to their intertwined and inseparable relationship, Rolex began referring to the watch itself as the ‘Rolex President Day-Date Chronometer’ during the 1980s. The official use of the “President” name was short lived, and Rolex has since returned to just calling the watch the Day-Date. However, the President name stuck, and has become a ubiquitously-used term within the world of Rolex collecting and beyond. For more information on the Rolex President, check out our video on the current model of the Day-Date, the reference 118238, which can be found (right here) YouTube. 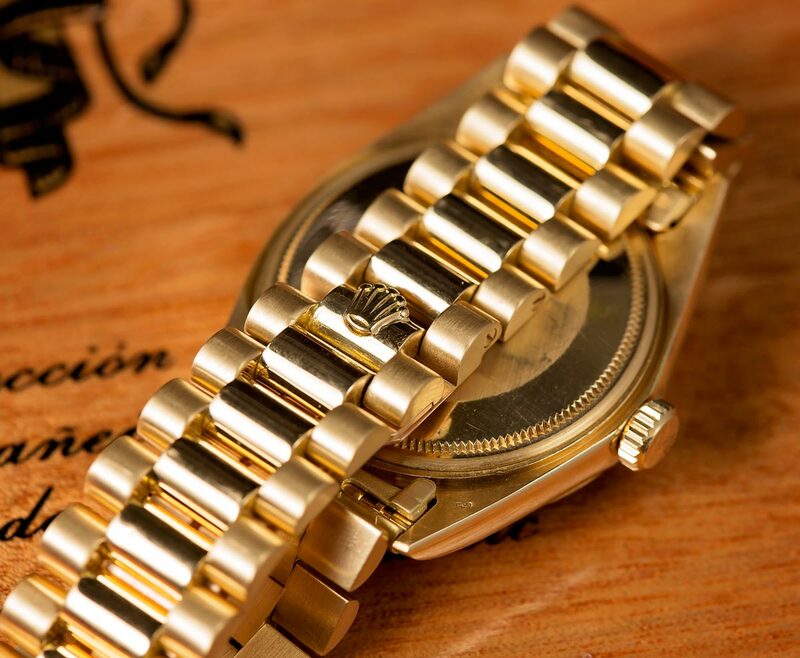 A Rolex President bracelet in 18k yellow gold, complete with its ‘Crownclasp’ concealed closure system. Ripley is the Senior Editor at Bob's Watches. As a Los Angeles native with an interest in all things mechanical, Ripley has had a love for watches since a young age, when his mother gave him a children's Swatch to help teach him how to read the time. While most of his days are now occupied by the world of vintage and luxury timepieces, Ripley can often be found exploring the United States National Parks or running and hiking outside with his dog, Ziggy.